South African Airways’ (SAA) catering unit plans to lay off about 118 workers, the National Union of Metalworkers of South Africa (NUMSA) said in a statement. Air Chefs intends to retrench 118 workers out of a workforce of about 1,200 people, the union said, adding that it would oppose the planned job cuts. NUMSA said it was engaging with SAA Chief Executive Vuyani Jarana on the planned job cuts and consultations are expected to take place on Friday. The Carrier’s spokesman Tlali Tlali has confirmed to Reuters that SAA would meet labor unions from June 19 to discuss the planned job cuts in talks facilitated by the Commission for Conciliation, Mediation and Arbitration. South African Airways has appealed to the government for $404 million to cover immediate costs and warned that it may be unable to make debt repayments next year as the state carrier battles to stay in operation. The carrier’s net loss widened more than threefold to 5.6 billion rand in the 2017 financial year. 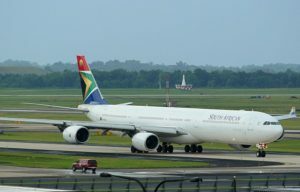 The airline suspended two executives including Chief Financial Officer Phumeza Nhantsi in March. Posted by Steven Addamah on June 10, 2018. Filed under News. You can follow any responses to this entry through the RSS 2.0. Both comments and pings are currently closed.